Today is the birthday (1166) of King John, also known as John Lackland (Norman French: Johan sanz Terre), king of England from 6 April 1199 until his death in 1216. Following the battle of Bouvines, John lost the duchy of Normandy to King Philip II of France, which resulted in the collapse of most of the Angevin Empire and contributed to the subsequent growth in power of the French Capetian dynasty during the 13th century. 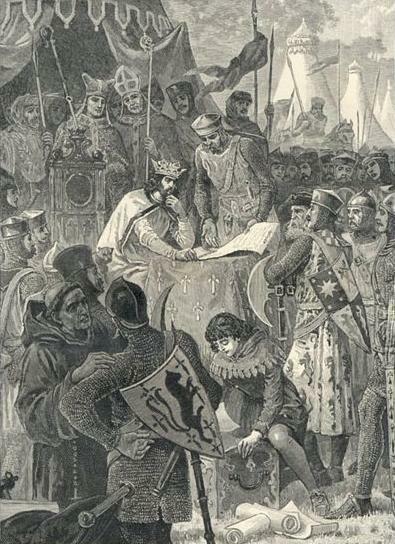 The baronial revolt at the end of John’s reign led to the sealing of the Magna Carta, a document sometimes considered to be an early step in the evolution of the constitution of the United Kingdom. If this were any other day of the year I’d give you a long diatribe on why most of what you think you know about John is wrong. Magna Carta was not, in itself, much of a milestone. The barons were not interested in justice; they wanted to replace John, they just didn’t have a good candidate, so settled on Magna Carta as a poor plan B. Afterwards neither John nor the barons paid any heed to the document. Most especially, John was not the great villain he is made out to be. That was the product of 19th century novelists such as Sir Walter Scott moralizing about his sexual habits, which were atrocious, and fanciful tales of Robin Hood that needed a convenient bad guy. In a lot of ways John was good for England. For one thing, he was the first king of England since before the conquest who actually spoke English. All the others spoke French and spent more time in their French holdings than in England. John’s brother, Richard the Lionheart, for example, spoke French and spent all but 6 months of his reign outside of England, going to war in various places, and bankrupting the country in the process — in fact, leaving John with a mess to clean up. However, it is Christmas Eve, so I will pass over this juicy and heady stuff. Instead I will give you an alternate view of King John courtesy of A.A. Milne (with a Christmas theme). This is an all time favorite of mine since childhood taken from Now We Are Six. He stayed in every afternoon . . .
And envying them all . . .
One of the many legends about King John is that in defending his kingdom he was forced into the tidal regions of East Anglia where he first lost the crown jewels, and then, in a fit of depression, overate and died. All hogwash of course. He lost a couple of pack animals, and he died of dysentery (called “ague” back then) which he had contracted some weeks before (common hazard of Medieval war campaigns). Nonetheless, as a young cook I was taken with the common story that he died of a “surfeit of peaches” and created a recipe called King John’s Surfeit. I had not made it in years before contemplating this post. But I got out the pots and pans for the occasion. I’ve never codified it into a recipe, so, as often, you will have to make do with my memory version with its vague notions of quantities. It is a very sweet dish so barely sweetened whipped cream or ice cream I find are necessary accompaniments. Making sure it is very well chilled is also important. Slice dried peaches and marinate them in brandy for at least 24 hours, and preferably a week or more. Take a quantity of peaches (about one per person), wash them well, and poach them in white wine and sugar flavored with cloves and allspice until they are very soft. You can use hard under ripe fruit for this. Let the peaches cool and scrape out the cooked flesh, mashing it well in the process. Reduce the cooking liquid to a thick syrup and let cool. Refrigerate all the ingredients. Assemble by mixing the mashed, cooked fruit with marinated dried slices. Scoop into bowls and top with vanilla ice cream drizzled with the syrup.